Finding somewhere to adopt your new friends is only one part of preparing to own pet rats. You also need to stock up on all the things you need to keep them healthy, happy and comfortable. This post will take you through the key pet rat supplies needed before adopting rats. Pet rats need somewhere to live, and just like humans their home needs to be safe and comfortable with a good flow of fresh air, and enough space to behave naturally and not get bored. The first thing to decide when buying a cage is how big you want it to be. Many cages that are sold as rat “starter” kits in petshops are not big enough for rats to live in happily (be especially cautious of cages sold for “rats and mice” – the two types of animals have different requirements). Once you have a cage size in mind, pop the measurements through a cage calculator. This will tell you how many rats can safely live in it (my current cage is apparently big enough for 58 rats!). Next, make sure the bar spacing is suitable for the rats you plan on keeping – many of the larger cages are designed for ferrets or guinea pigs and have 2 cm + bar spacings that younger rats and does can squeeze through. However, avoid plastic and glass tanks which don’t give rats enough fresh air, and wooden hutches which absorb pee, and are easily chewed. Once you’ve shortlisted a few cages that are suitable for your planned rats, have a look at how their doors and bases are set out, and think about how you would clean them and put furniture in. The last thing a rat owner wants is a cage where they can’t reach the corners! My favorite cages are the critter nation style (either a single story cage or a two story cage) as the fully opening front makes life so much easier. Where there are only a pair or trio of rats and they need to live on top of other furniture, I like the Savic Freddy 2 Max (sold in the UK). Choosing the right bedding for your rats is really important, as it is something they are in daily contact with. Choosing the wrong bedding can be bad for their health. nesting materials that rats drag into their beds to make themselves comfy. The key thing when choosing a substrate is to find something low dust, non-toxic, unscented (rats have sensitive little lungs), and without sharp bits or long stringy bits that could cause physical injury. You can read a full assessment of the different substrate types I use here. For litter, I favor an unscented 100% recycled paper cat litter. I haven’t found anything better yet – wooden and mineral cat litters aren’t safe for rats as they disintegrate into dust when wet. They could also cause blockages if the rats eat them (which they will). For nesting material I mainly give my rats newspaper and paper kitchen towels. I just put the full sheets in and let them do the rest. If it is very cold I also give scraps of fleece fabric. I recommend building up your supply of cage furniture over time, and also looking at what you can creatively make rather than buy expensively from pet shops. However, there are some things you need in the cage from the start. If you want to litter train your rats, then you need to make a dedicated place for them to poo and pee. I use a mixture of cheap plastic cat litter trays from the supermarket, and corner litter trays designed for rodent cages. Rats often like to tuck themselves away to sleep, so it’s good to give them a range of options. Mine have the choice of hammocks, baskets or houses. Their hammocks are mostly old tea-towels or $1 t-shirts from the op-shop because they chew them, but you can by flat beds, tubes, and bunkbeds new. If you are handy with a sewing machine, it’s also easy to make hammocks to fit the cage – just choose a safe material such as fleece and remember to think about how to hang them (nappy pins in my case!). For baskets, I use plastic baskets from the hardware store, while for houses it is a mixture of cardboard boxes (changed every few days for hygiene), igloos or sputniks. My horde are still going for the world record of how many rats can fit in a large sputnik. So far they’ve managed about 7, although there were bits of rat being squeezed out of all sides. Rats spend most of their time in the cage, so they need things in there to explore and play with. Options include ropes, tubes, exercise wheels, baskets, and boxes. As long as you always make sure your layout is safe for rats, the limit is your imagination. Rats need a constant supply of clean freshwater. Tap water is fine if it is drinkable – as with most foods for rats, if it is safe for you it is safe for them. I have a love / hate relationship with bowls of water. The rats adore them and it is a great form of play – they will happily dabble their paws, dunk their heads to wash their noses, pat bubbles and generally have fun. However, my particular group of unhygienic numpties have decided bowls of water are ideal for pooing in. Thanks guys. So, they only get a water bowl for an hour or two at a time and it’s an extra play thing rather than a source of hydration. For drinking water, the best way to offer it is in a gravity fed bottle. If you want to hang it inside the cage, it’s best to get a glass variety as plastic generally gets chewed. I always have at least two bottles per cage, as these bottles can sometimes get an airlock in, which stops the water flowing. I check the flow of all my bottles every day as well. It’s best to have a couple spare in case one stops working, starts dripping or springs a leak. Getting the right diet for your rat is important, but fortunately not too complicated. You can read about the different options and how I feed my rats here. How much food to give depends on the size of the group, their ages, and their activity levels. Growing rats will eat far more than adult sized rats, while elderly animals may not eat much of the shared food, but might need supplementing with other treats. The best way to work out how much to give is see how quickly the food gets eaten. It’s actually good for rats to have a couple of hours fasting a day, so I aim to feed enough that it will be mostly eaten up within about 22 hours. I don’t use a food bowl as I like to scatter the food to encourage the rats to forage. 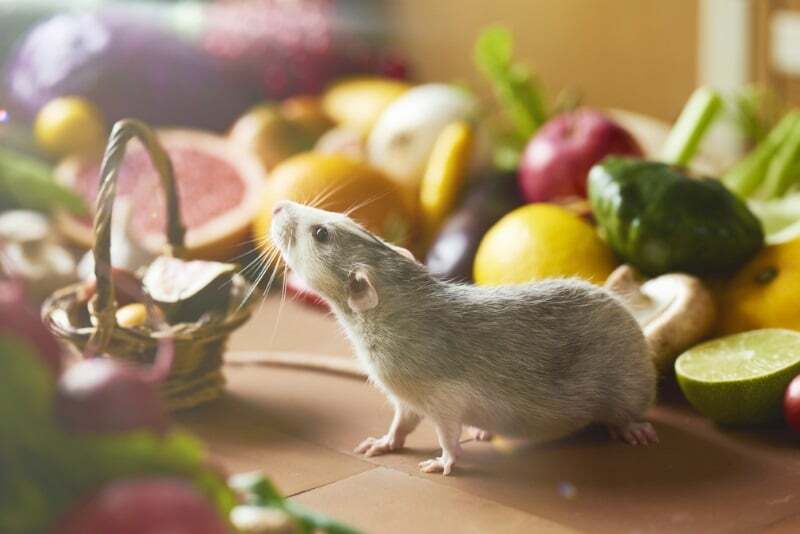 It helps them express a natural behavior and regulate their appetite – much like humans, if given lots of yummy food on a plate, rats will over-eat. However, if a bowl is needed I like using coop cups fixed to the bars as it is harder for them to be flipped over. To clean my cages, I use diluted F10 SC disinfectant, which is designed for use in animal enclosures and is pet safe. If that isn’t available in your country, then washing up liquid or child-safe disinfectants are an option. and a washing up brush for getting at tricky corners. To clean cage bases I either put them in a bath and hose them down with a shower attachment or take them outside and blast them with the garden hose. 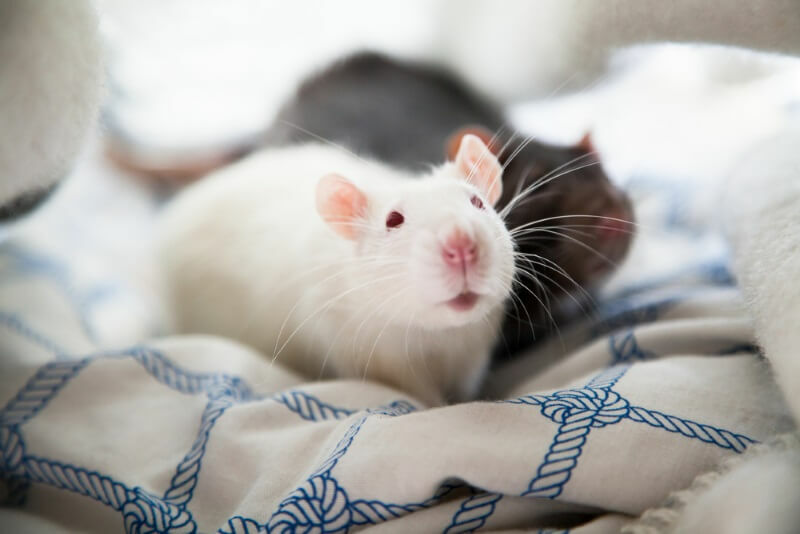 Most of the important medications for rats are prescription only and need to be used under vet supervision, so the most important preparation for rat health is to find a good vet. Ask around other owners or breeders in your area and see if any come highly recommended. When having to find a vet from scratch, I’ve had a lot of luck with exotics vets who otherwise specialize in reptiles, birds or wildlife. These vets are used to working on the most fragile of animal species, so they have no trouble when it comes to rats. In terms of an over-the-counter first aid kit, I have a Ventolin inhaler and a bottle of nuelin (liquid ventolin essentially) which can be really helpful in opening up the airways of a rat having respiratory problems. I also have a little dropper bottle of sterile artificial tears which are useful for washing gunky or sore eyes. The only other over-the-counter medication I use is an antiseptic cream. For painkillers I depend on developing a good relationship with my vet and being dispensed meloxicam (the animal NSAID), as I am not comfortable dosing the human versions. If a rat is seriously unwell, injured or in shock, it is important to keep them quiet, safe and comfortably warm (although not overheated) until you can get to a vet. A small animal carrier (see below) or small cage is useful in this situation. For bedding I use pieces of fleece, and I have a snugglesafe that can provide safe heat. A cage that is big enough to keep a group of rats in is pretty unwieldy when it comes to moving around, so for transporting rats a small pet carrier is really useful. For one or two rats I use a carrier designed for smaller animals. For larger groups, I use a cat carrier, making sure the grid on the front and top is either narrow enough to prevent escapes, or covered in chicken mesh. It’s also really handy to have a spare cage for use if rats need to go and stay with a pet sitter, if you need a hospital cage, or if you want to later introduce new animals to your group. The ideal size for a spare cage is one that can house 2-4 rats on the cage calculator and which can be easily folded down for transport. Welcome to Animallama, a place where pet parents share all the pet care tips they learned over the years of caring for their fur friends. Plus, we cover wild birds too! Some of the links on this blog are affiliate links. This means that I may receive a small commission at no cost to you if you purchase something through an affiliate link.